The STELA Double Sided is part of our ribbon gas fire range. This 10Kw gas burner has a dancing ribbon of flame and a wide range of enclosure options – with or without a trim. 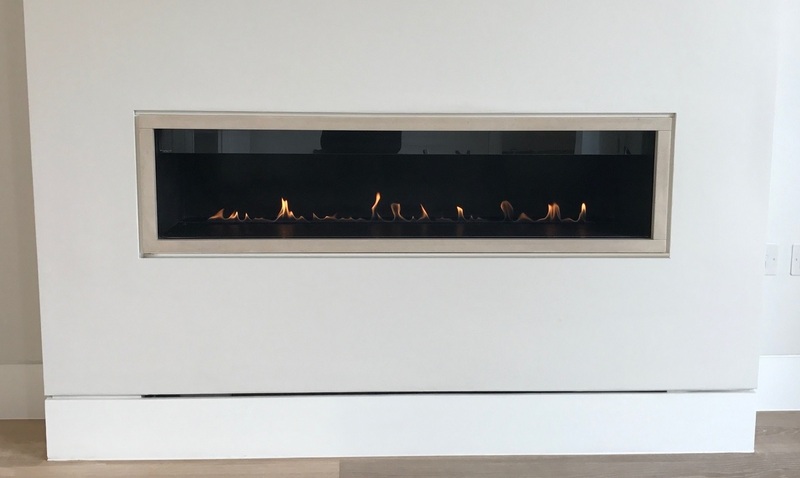 The STELA ribbon gas fire has minimal depth (320mm) and is available with either brushed stainless, black, polished or natural stone interior. There is an option to add either logs or pebbles if desired. 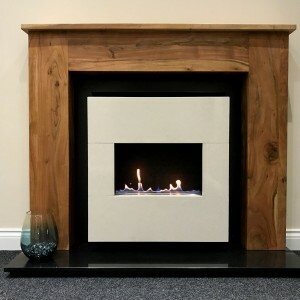 This modern, CE approved, ribbon gas fire, is operated by an RF remote system with a handset. The remote is programmable and includes a thermostat to control room temperature. 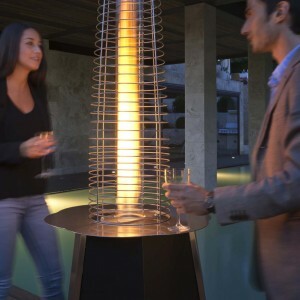 The STELA is available for use with either Natural Gas or LPG/Propane and can be installed in the UK, Ireland and all other European Countries. 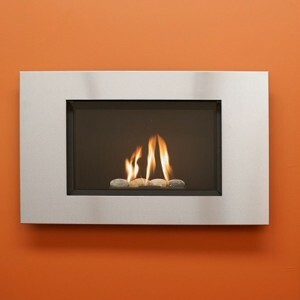 The fireplace is supplied as a complete package including a gather unit with a 180mm spigot. The STELA has been designed to be installed in most properties. See technical drawings for dimensions and installation information. To discuss the installation in detail call sales on 01325-301020. DIMENSIONS: See attached technical PDF specification. Letterbox (opening) size: 1200mm x 270mm. Depth 315mm. 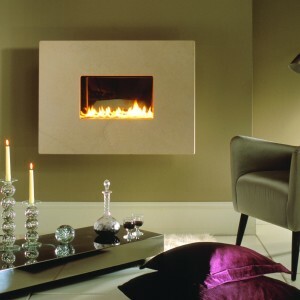 CERAMICS: Choose from either a clean ribbon of flame, logs or pebbles. IGNITION: The fire is operated by a RF (radio frequency) battery powered remote system with handset. A mains power pack is available as an upgrade. The batteries have a life of 12 months or greater depending on usage. High quality batteries should be used. The handset shows the condition of the batteries in the handset and also the fire. The remote includes a thermostat to regulate the room temperature. The minimum requirement is a 175mm x 3.0m length flue liner; the fire can also be fitted into a class1 or precast chimney which meets the minimum requirements. The fire has minimum depth so will fit most existing chimneys. The fire is supplied with a gather fitted. This must be used. The fire has a power rating of 10Kw and requires an 8mm gas inlet. This is a powerful fire and to ensure it is reliable the pipework to the fire must be capable of supplying a steady inlet pressure and should be routed using at least 28mm pipes reducing to 8mm at the fire. The pipework should be routed to ensure no pressure drop when other gas appliances in the home are being used. GLASS: There is a small glass slip at the top of the enclosure, this is fitted at the factory and is required for the fire to function safely. SAFETY: Tested to the latest CE safety standard. Fitted with ODS (Oxygen Depletion System) safety system which monitors oxygen levels in the room and shuts off the fire should the chimney be blocked. o It is advised that when operating the appliance in a room where children or elderly people will be present that a fireguard should be used. These are available from our web store. VENTILATION : The fire requires an air vent which can supply a minimum of 100cm2 air. We can supply a high quality air vent with the fire. Our air vents have baffles and a draft cowl to ensure that they provide air only. Ask for details.